by Samuel S. Hill, Ph.D.
III. Is Scientology a Religion? by Gary D. Bouma, Ph.D. 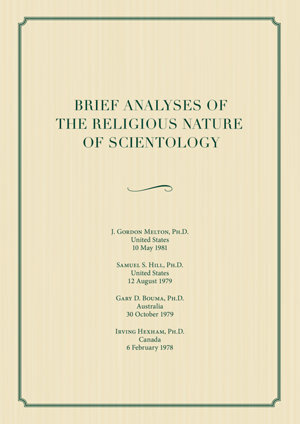 Emerging in the early 1950s, the Scientology religion since its inception has drawn much interest over the years from religious scholars around the world. This study contains four brief analyses from the hundreds of existing studies published on Scientology. They were written in the years 1978 to 1981. Their authors represent unique perspectives and geographical and philosophical diversity. J. Gordon Melton, Ph.D., is Distinguished Professor of American Religious History at the Institute for Studies of Religion, Baylor University, in Waco, Texas. For over forty years he has also served as director of the Institute for the Study of American Religion, now based in Woodway, Texas. Prior to moving to Baylor in 2011, he served as research specialist at the University of California, Santa Barbara, where the Davidson Library on campus now houses the J. Gordon Melton American Religion Collection. Dr. Melton is the author of hundreds of articles and more than thirty-five books on the academic study of religion, including Melton’s Encyclopedia of American Religions (8th edition, 2009); Religions of the World: A Comprehensive Encyclopedia of Belief and Practice (2nd edition, 2010); Religious Celebrations: An Encyclopedia of Holidays, Festivals, Solemn Observances, and Spiritual Commemorations (2011); and most recently the four-volume Faiths across Time: 5,000 Years of Religious History (2014). He is a graduate of Birmingham-Southern College (B.A., 1964), Garrett Evangelical Theological Seminary (M.Div., 1968), and Northwestern University (Ph.D., 1975), and also ordained as an elder in the United Methodist Church. He sits on the international board of the Center for Studies in New Religions (CESNUR) based in Turin, Italy. Samuel S. Hill, Ph.D., is professor emeritus of religion at the University of Florida, where he served as department chair from 1972–1977. He previously taught at the University of North Carolina and Stetson University. Dr. Hill is a renowned scholar in the fields of American religious history, new religious movements and, in particular, religion in the American South. He has authored dozens of articles and has written or edited a dozen books, including Southern Churches in Crisis (revised and updated, 1999); The South and the North in American Religion (1990); Handbook of Denominations in the United States (tenth edition, 1995); and One Name but Several Faces: Variety in Popular Christian Denominations in Southern History (1996). “The Sam Hill Lecture in Southern Religion” at the University of North Carolina (Asheville) is named in his honor. Gary D. Bouma, Ph.D., is professor emeritus and UNESCO Chair in Intercultural and Interreligious Relations at Monash University in Melbourne (Australia). He is an ordained Anglican priest and an acclaimed researcher in the fields of sociology and public policy. He has authored or coauthored over twenty-five books, including Australian Soul: Religion and Spirituality in the Twenty-First Century (2006); Democracy in Islam (2011); Being Faithful in Diversity: Religions and Social Policy in Multifaith Societies (2011); and Religious Diversity in Southeast Asia and the Pacific Islands: National Case Studies (2014). He has served as past president of the Australian Association for the Study of Religions as well as past chair of the board of directors of the Parliament of the World’s Religions (2009). In 2013 he was invested as a Member of the Order of Australia (AM). Irving Hexham, Ph.D., is professor of religious studies at the University of Calgary. He holds a Ph.D. from the University of Bristol and is an expert in the fields of religion and politics, nationalism, new religious movements, African Christianity and academic fraud. He has authored dozens of articles and written or edited over a dozen books, including The Irony of Apartheid (1981); Understanding Cults and New Age Religions (1986, with Walter Block); New Religions as Global Cultures (1997, with Karla Poewe); and Understanding World Religions (2011).